My husband and I were fortunate to visit Thailand the year before the tsunami hit. We were able to see Bangkok, Chiang Mai, and the island of Phuket. One of my favorite memories was a visit to the Chiang Mai cooking school. Before going, I couldn’t get my husband to eat Thai food. Since the cooking school, he loves it. In fact, we eat Thai food on the average of once a week. I make the recipes I learned in class often at home, using local ingredients. The town of Chiang Mai is rather granola, in American terms: kind of a hippie, naturalistic style to the town. I will never forget the look on my husband’s face when the burlap covered pickup picked us up at our hotel on the morning of cooking school. It was a “what have you gotten me into this time, Rita?” kind of look. Part of me thought he wasn’t going to get in. That part was a little too much Thailand, not enough Scottsdale for him. After a choppy ride, we arrived in their outside covered facility. Each of us got our own stove and cooking supplies, a cookbook, and several funny teachers to help us prepare five or six authentic Thai foods, using local ingredients. I’ve discovered when traveling abroad you meet other people who travel abroad. Several couples in cooking school had spent a year or more traveling throughout the world. One had just been to Kathmandu. How exotic. The day spent in cooking school was one of the best days of any vacation I’ve ever taken. I can’t recommend this place enough. 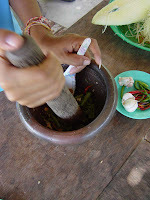 Chiang Mai cooking school was founded by husband and wife Sompon and Elizabeth Nabnian. Sompon claims he was born in a kitchen when his mom was cooking breakfast. After his experience as a novice monk, Sompon decided to be a guide, which involved taking tourists on treks and cooking three meals a day in the jungle. It was during his experience as a guide he met Elizabeth and decided he wanted to open a cooking school. Elizabeth is English, and they moved to England to get experience cooking Thai food abroad. They found Thai ingredients are available worldwide and those ingredients that are local can be substituted with other ingredients. The school was founded in 1993, and has achieved international success. The couple has been featured on the National Geographic Channel and in Lonely Planet tour books. They also have opened a restaurant in Chiang Mai called the Wok, and recently opened a spa called the Jasmine Rice Village Resort and Spa, also in Chiang Mai. I found you through Mom Bloggers Club. I am glad you and your family had a good time and enjoy both Thailand and foods. Healthy eating is good for the body and soul. thank you for the article.